QUESTION: Mr. Armstrong; Thank you so much for taking the time to explain what is often complex subjects in a common sense manner. You seem to be more concerned about deflation than inflation and I can see how this obsession with raising taxes is very deflationary. My family’s healthcare costs have more than doubled under Obamacare. I do not see where this has helped at all. Then you try to buy this Obamacare because I am being cancelled and you are told they are closed for the year. This is a real joke and the media just preaches how great it is. I am starting to feel we live in the old Soviet Union and the press is so untrustworthy it is not even funny. It looks to me that this type of taxation is more lethal to the economy than this idea of hyperinflation. This this what you are telling us for it certainly feels that way on this end? ANSWER: You are correct. The two greatest evils are actually TAXATION and DEFLATION insofar as eroding the disposable income reducing the economic growth. Just look at from a practical perspective. The Mafia comes in town and says you have to give them 50% of what you earn. You feel this is unfair and unjust. Now replace the word Mafia with government. There is no material difference. Claiming what government does is somehow not as evil as a criminal shaking you down is just nonsense. How they spend what they take from you is irrelevant. It is the point that they are taking from you in the first place that reduces your disposable income and that is deflationary. 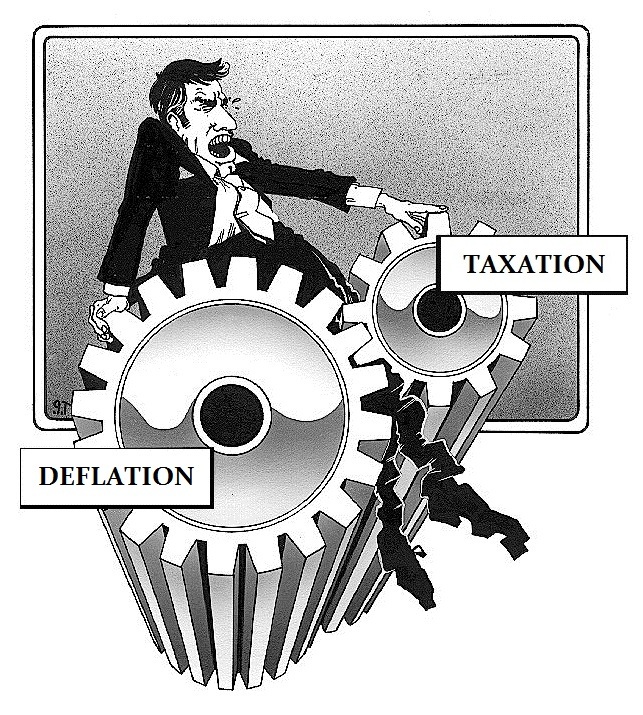 Established governments collapse in a deflationary spiral and these are set off by rising taxation that produces a massive contraction in net disposable wealth. Yes, there can be a debasement of the currency, but this has its limitations within an established government. Examples of Germany and Zimbabwe are governments that lose the ability to even borrow or pretend to owe anything. They typically have already defaulted upon their outstanding debts that are normally of a pre-existing political government. In the case of Zimbabwe, they lost the ability to even issue currency as people simply adopted the currency of foreign nations. We are dealing with established government who to sustain power will default on outstanding liabilities by changing the terms – no double dipping, raising age qualifications and removing any indexing to inflation. 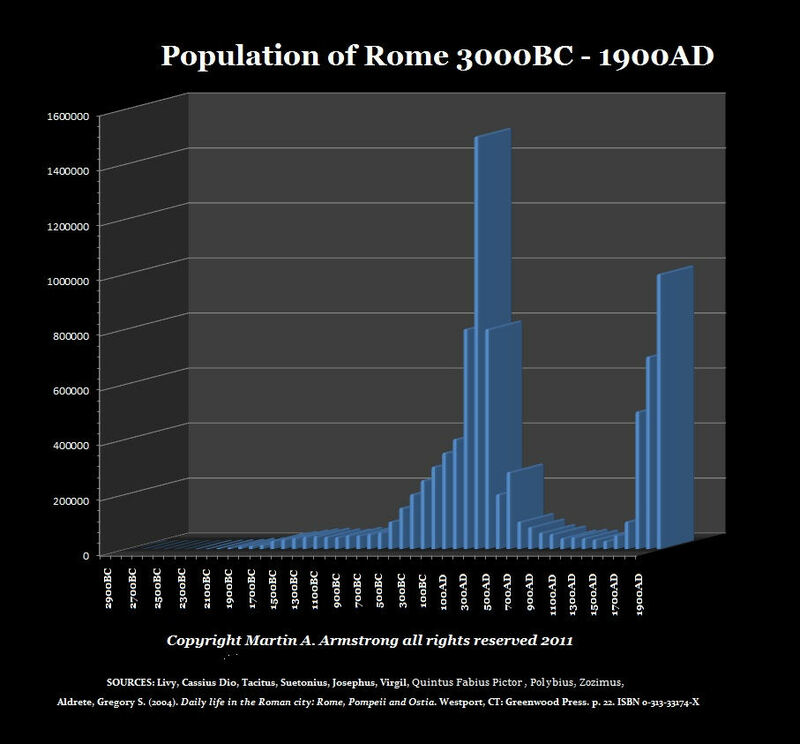 They will raise taxes and hunt down capital wherever it hides.Rome kept raising taxes so much, people just walked away from real estate. As government declines, security declines and the police become the criminals. In the case of Rome, armies began sacking Roman cities to pay for their unfunded pensions. All of these trends produce the vicious spiral of rising taxation and deflation. This is our greatest danger – not hyperinflation (measured in the thousands of percent).